Lawrence Alma-Tadema (1836–1912), This is Our Corner (Portrait of Anna Alma Tadema (1864-1940) (front) and Laurense Alma Tadema (1865-1940)) (1873), oil, 56.5 x 47 cm, Van Gogh Museum, Amsterdam. Wikimedia Commons. 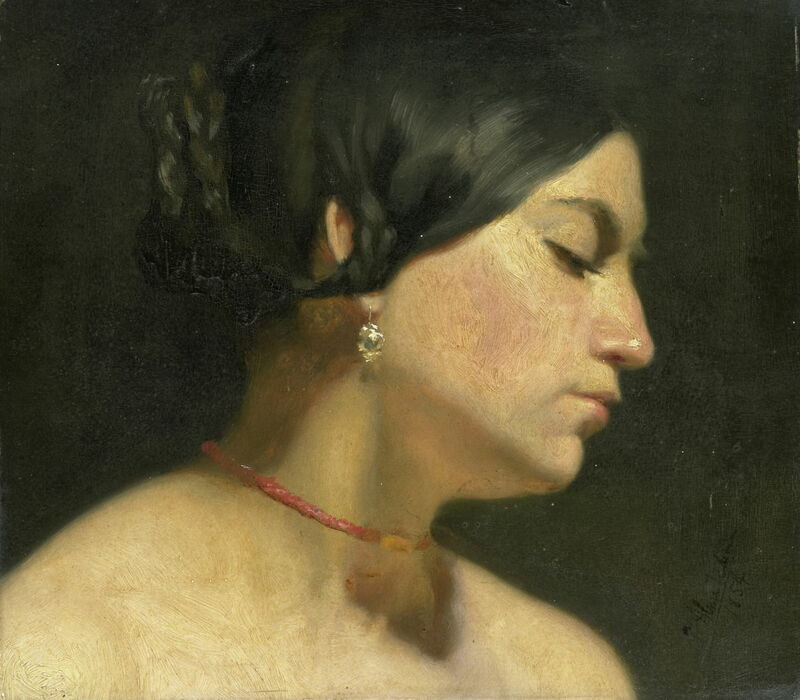 The four artists whose reputations bore the brunt of the early twentieth-century rush through Post-Impressionism to Modernism were John Singer Sargent, Frederick, Lord Leighton, Sir Edward Poynter, and Sir Lawrence Alma-Tadema. The high priest of that modernisation, Roger Fry, reserved his most damning and personal attacks for Sir Lawrence Alma-Tadema (1836–1912) – particularly in his savage article published in The Nation in January 1913, following Alma-Tadema’s death. If there is one thing that should make an artist worth looking at, it must be a personal attack by Roger Fry. So this and the following article will do just that, and I will try to understand what changes took place in Alma-Tadema’s paintings. Born as Lourens Alma Tadema in Dronrijp, in the north of the Netherlands, he was left to draw and paint following crises in his physical and mental health when he was only 15. By the following year, his skills were sufficient for him to enter the Royal Academy of Antwerp, Belgium, where he spent four years. During the later years of that training he worked as a studio assistant to one of the professors at the academy, and became fascinated by Merovingian history. Lawrence Alma-Tadema (1836–1912), Maria Magdalena (1854), oil on paper mounted on panel, 31 x 35 cm, Rijksmuseum, Amsterdam. Wikimedia Commons. Maria Magdalena (1854) is one of his earliest surviving works, from his student days. The upper half of a painting of a half-length figure of Mary Magdalene, it shows his rapid progress in oils. The other sheet forming the lower half of the painting has also survived, but is somewhat the worse for wear. Lawrence Alma-Tadema (1836–1912), The Blind Beggar (1856), oil on canvas, 63.5 x 54 cm, Walters Art Museum, Baltimore, MD. Wikimedia Commons. The Blind Beggar (1856) is another student painting, this time of a contemporary genre scene with a strong social message. 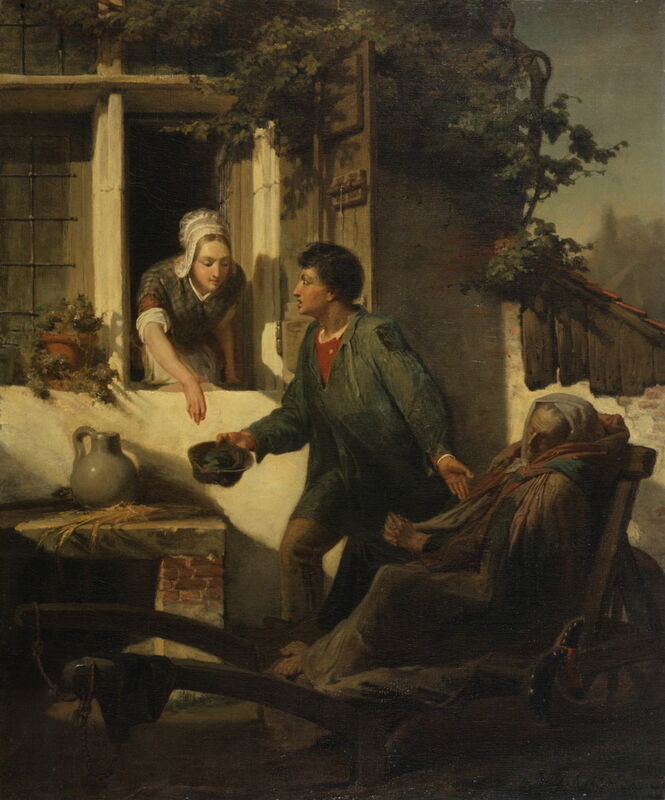 A young woman leans out of her window to drop coins into the hat of a poor young man, who is begging on behalf of an elderly and blind person in an improvised cart. Its composition is simple but effective, and it tells its brief story well. Already Alma-Tadema is showing his eye for painting every little detail, such as the bolt on the window shutter, and the tatty clothing of the young man. 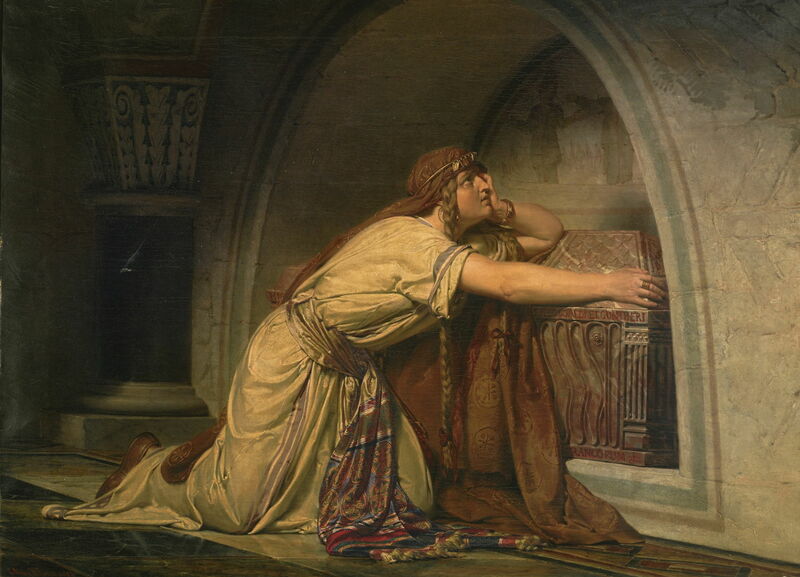 Clotilde at the Tomb of her Grandchildren (1858) is one of his first Merovingian history paintings, which was exhibited in Antwerp at the Salon in 1858, priced at 400 francs. 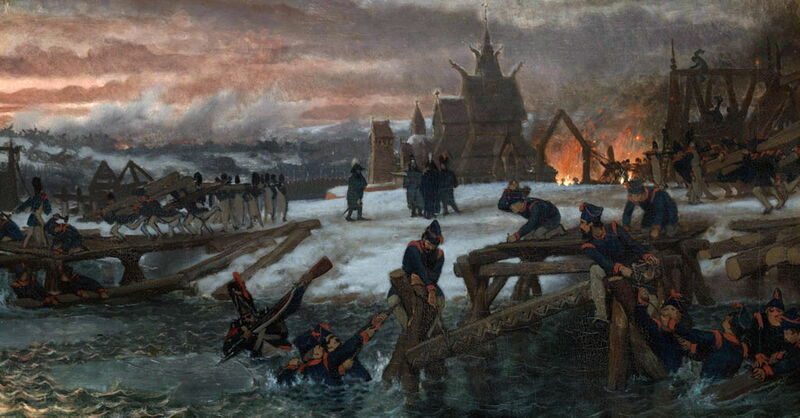 It was painted in his professor’s studio, and shows a scene worthy of Évariste Luminais after the Franco-Prussian War. Saint Clotilde (c 475-545) was the second wife of King Clovis I, and princess of Burgundy. Frankish rulers of the day were apt to murder and be murdered: after a lifetime of such violence, her eldest son Chlodomer was killed in the Battle of Vézeronce. Although she tried to protect the rights of her three grandsons by Chlodomer, from her son Chlothar, the latter had two of them killed, and the third escaped into a monastery. Alma-Tadema shows a most unusual situation for a grandmother, of mourning her two grandchildren who had been killed by their uncle, her son. Following this, Clotilde devoted herself to saintly works. In 1858-9 he moved to work for Baron Jan August Hendrik Leys, who also acted as his mentor. Leys was an avid painter of mediaeval scenes, who was also a major influence on the early work of James Tissot. Lawrence Alma-Tadema (1836–1912), Crossing of the River Berizina: 1812 (c 1859-69), oil on canvas, 39 x 73 cm, Amsterdam Museum, Amsterdam. Wikimedia Commons. Over this period when much of his work centred on Merovingian history, Alma-Tadema painted modern history in his Crossing of the River Berizina: 1812 (c 1859-69), which shows the Battle of Berezina of 26-29 November, 1812. This was one of the catastrophes to befall Napoleon’s army after its failed invasion of Russia, during its long and agonising retreat through the frozen wastes of eastern Europe. The site is near Barysaw (Borisov) in modern Belarus, where Napoleon’s army had to cross this tributary to the River Dnieper, on its retreat towards Poland. Alma-Tadema shows sappers working in freezing water to build improvised bridges across the river, which they had expected to be frozen. The two bridges which they completed allowed most of the army to cross, although the French lost around 20,000 personnel out of a total of over 80,000 (including stragglers and supporters), in this single action. The word Bérézina entered the French language as a synonym for a disaster. 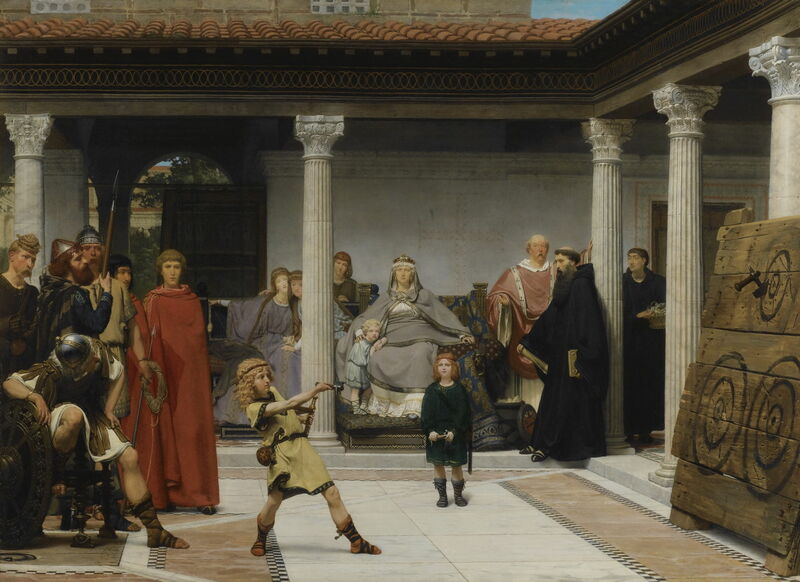 The Education of the Children of Clovis (also known as The School of Vengeance, or The Training of Clotilde’s Sons) (1861) returns to tales from Merovingian history, showing Saint Clotilde watching her young sons being taught the royal art of axe-throwing. It is no wonder that later one of them was to murder two of her grandchildren. In 1862, Alma-Tadema set up his own studio, and the following year he married, honeymooning in Florence, Rome, Naples, and in the excavated ruins of Pompeii, nearby. Following the death of his wife from smallpox in 1869, his own health faltered, and he went to London for further medical opinion. There he befriended Ford Madox Brown, and met the young woman who was to be his second wife. With the Franco-Prussian War in 1870, Alma-Tadema fled again to London, where he settled in the September, marrying his second wife the following year. He quickly became friends with the artists of the Pre-Raphaelite Movement, and his palette brightened. He enjoyed rapid commercial success, and in 1873 Queen Victoria made him an official ‘Denizen’, which gave him most of the rights of citizenship. Sunday Morning (c 1871) shows the interior of a house in the Netherlands in the seventeenth century. 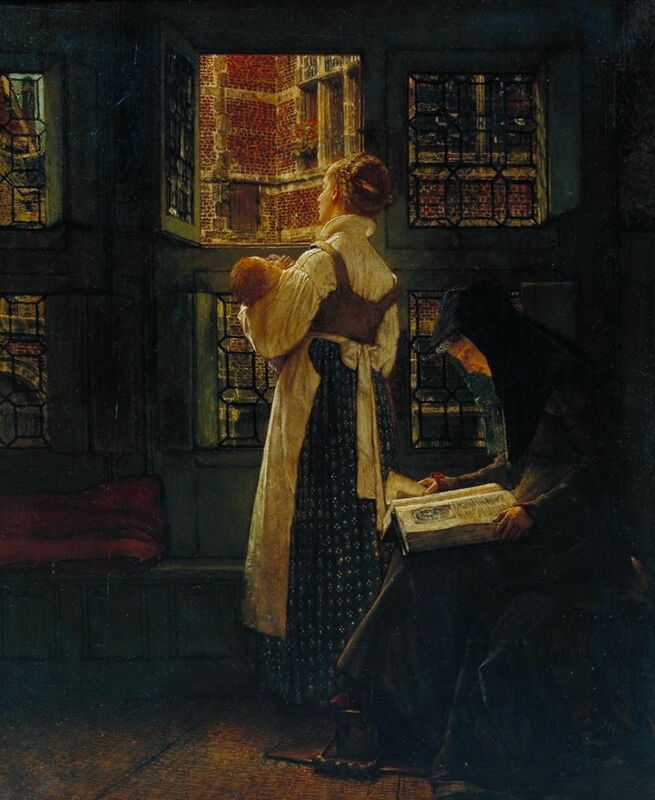 The mistress of the house has just had a baby, and her midwife is holding that baby as she looks out into the daylight. This is a smaller version of a previous painting by Alma-Tadema titled A Birth Chamber, Seventeenth Century (1868), which extended the view to include the mother in bed. Both paintings show influence from the genre scenes of Pieter de Hooch, Nicholaes Maes, and Gerrit Dou, in the seventeenth century, probably transmitted to Alma-Tadema by Joseph Dyckmans (1811-88). Lawrence Alma-Tadema (1836–1912), The Vintage Festival (1871), oil on panel, 51 x 119 cm, National Gallery of Victoria, Melbourne, Australia. Wikimedia Commons. The Vintage Festival (1871) is one of two very similar versions of the same scene, painted using the much brighter and lighter palette which he developed as he settled in England. It marks the start of his mature style, using classical Greek and Roman themes, which he depicts in intricate detail. These details were researched extensively, sometimes taking as long as two years for a single painting. Following early criticism of his initial attempts to depict the surface properties of marble, Alma-Tadema devoted a great deal of effort to painting marble better than any previous artist, so becoming the master of marble. The meticulous detail in his paintings often gives the impression that these are large canvases and panels, although many are quite small. He was obsessive with what he saw as accuracy, and repeatedly repainted passages until he felt they were perfect. This painting shows Alma-Tadema’s vision of a Bacchanal being celebrated by musical Bacchantes in a private villa. Its tame nature may surprise those accustomed to thinking of such festivals as rampage, but gives scope for fine details such as the leather straps on the faces of those playing wind instruments. It also has a strong sense of Aestheticism, with its evocation of sound and music, as well as the heady aromas from burning incense. 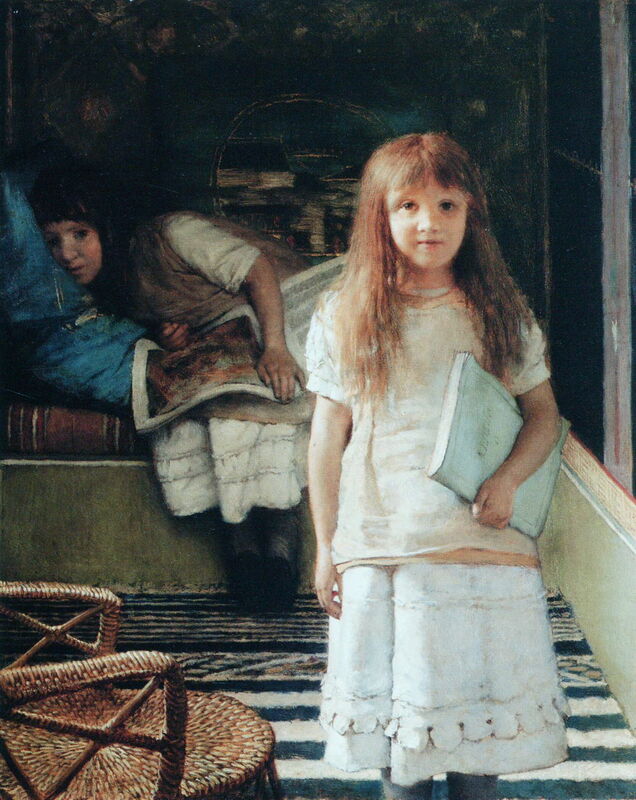 Alma-Tadema was also a skilled painter of portraits; his most touching, though, must be This is Our Corner (1873), a double portrait of his daughters (from his first marriage) Anna Alma Tadema (1864-1940) in front, and Laurense Alma Tadema (1865-1940) behind. They both remained unmarried through adult life: Anna became an accomplished artist (I will write an article about her soon), and Laurense or Laurence a prolific novelist and poet. Barrow RJ (2001) Lawrence Alma-Tadema, Phaidon Press. ISBN 978 0 7148 4358 2. Posted in General, Painting and tagged Aestheticism, Alma-Tadema, Brown, Leighton, Luminais, narrative, painting, Poynter, Sargent, Tissot. Bookmark the permalink. Just been to see the exhibition in Friesland, well done, attractive, in a modern building but VERY long queues. Wish I could go to Leighton House, London too, a very attractive building. Your article here good. Looking for ‘was Vincent in London at the same time as Lourens?’ -yes, but did they meet? Don’t know, not impossible. Thank you for your kind words. You are fortunate to have been able to go to that exhibition!